Can I paraphrase that buses saying here – you know, good books are like buses, you wait for ages for one and then three come along at once. And even better, the first two were impulse buys in bookstores – something I find myself doing fairly infrequently nowadays, so bonus! Here are my thoughts on three YA books – one being a space opera adventure, the second a contemporary romance, and the third a futuristic romance. 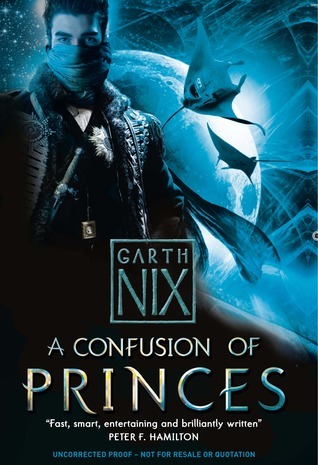 The first serendipitous finding was Garth Nix‘s A CONFUSION OF PRINCES, which turned out to be an imaginative YA SF romp through space. I hadn’t heard of this book before, though having done a quick blog search since, there appears to have been a spate of reviews when it was released earlier this year, which I obviously completely ignored. The engaging (and totally self-centred) narrator, Prince Khemli, made this book for me, and although I normally hate the foreshadowing device, having Khemli announce at the start that this is the story of how he has died three times adds a certain something. Khemli may be a prince, but in an empire that has ten million princes and all of them vying to be the next Emperor, the title has less meaning than you would expect. So Khemli needs to figure out just how he can put himself into contention for the Imperial throne – and solve various mysteries on the side, like just why has he, of all the millions of princes, has been assigned a Master of Assassins (head bodyguard, in other words) who is more than competent (not that he’s complaining)? This is the kind of story where the protagonist manages to get himself slowly but surely entangled in what appears to be a no-win situation, and I had no idea how Khemli was going to pull it off until the very end. Perhaps as a trade-off for the strong and charismatic first-person narrative, the secondary characters felt less well-drawn, and the love interest was probably the weakest part of this book (I found it difficult to believe that it was the forever kind of love), but all in all, an unexpectedly fun and enjoyable SF story that I finished in one go. I’d love to read more set in this world, and also really need to get around to reading Garth Nix’s SABRIEL. The next book won’t be a surprise for those who have seen my recent Goodreads updates as I’ve been busy adding the rest of Miranda Kenneally‘s books to my To Read shelf. 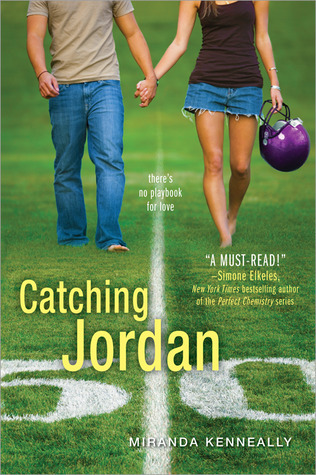 CATCHING JORDAN was another impulse purchase, but this time what tipped me into buying the book was that I recalled seeing positive reviews around the blogosphere for this YA romance centred around American football. Despite knowing next to nothing about American football*, CATCHING JORDAN really worked for me – I loved that Jordan was so passionate about her sport, I loved her positive relationships with her guy friends on the football team (and her eventual realisation that girl friends were equally as good), and I loved her close family ties (there may have been a few sniffles at the end as Jordan and her father figured each other out). And while there was potential for too much annoying obliviousness when it came to the “right” love interest, it didn’t drag on for too long, and the eventual romance was swoon-worthy. I want more, and I’m looking forward to reading the companion book STEALING PARKER. *Or perhaps because of that – I’ve noted some reviews that feel the sports element wasn’t that realistic. 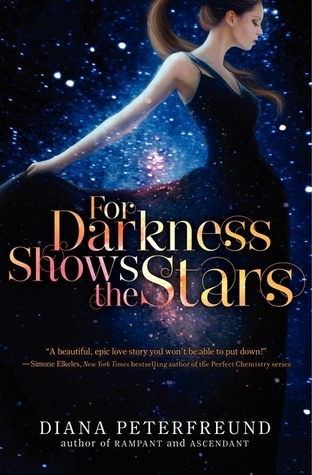 And the third – Diana Peterfreund‘s FOR DARKNESS SHOWS THE STARS. This wasn’t an impulse buy – I’d been planning to read it ever since it was released back in June. But I was never quite in the mood for post-apocalyptic YA fiction until now (and if I’m really honest, I don’t think I was really in that mood – I just wanted to get a book off my TBR pile). So I cracked open FDSTS and started reading Elliot and Kai’s correspondence to each other… and didn’t surface for air until the very last page, which was when I heaved a sigh of pure satisfaction. I adored this re-interpretation of Jane Austen’s PERSUASION – FDSTS was a perfect translation of not just the romance, but also the unstoppable march of change, to this strange new world of Luddites and Posts. While the basic bones of the plot owed its inspiration to Austen, Elliot and Kai’s own story had quite a few twists – some which I suspected, and others that caught me by surprise (yet made complete sense in retrospect). I understood Elliot’s strong sense of duty as part of her inherited obligations as a Luddite. I understood Kai’s frustration with the status quo for Posts and his need for something different. With an excess of stubbornness and pride on both sides, the scene was set for a memorable love story. But FDSTS was also so much more than just a romance. I loved the thought that had gone into creating a distant future that could be, providing a backdrop against which age-old money and power conflicts played out. And there were some scenes… picturing Kai and Donovan’s daredevil stunts when reading the cliff scene made me feel as though I had vertigo, and I think I was actually holding my breath as I read Kai’s final letter to Elliot. Ha, Garth Nix. Haven’t read him… Is this a series? No, A CONFUSION OF PRINCES is a standalone, which I appreciated. I’ve only read a short story by him before this, but he’s written this fantasy series where I umm… have the first two books, so really need to get started. SABRIEL is the first one IIRC, and I picked up the second book at a book sale as I was gambling I would like it! I remember your review of CATCHING JORDAN, and I think there were several others as well earlier this year? All the football talk completely flew over my head, but I just liked the story. It’s the UK cover – I think there are slightly different US and Australia covers floating around. I like how all of us have SABRIEL on our to-read lists but haven’t quite gotten around to it! Bwhahaha, I actually hadn’t heard that phrase about buses before (I did grow up somewhere completely devoid of public transportation), so I really had no idea where that title was going–but it makes perfect sense! I want to read ALL THE BOOKS. I’ve been holding back on Garth Nix until I read Sabriel myself (I only have had a copy I borrowed from my 6th grade English teacher since, well, 6th grade), but I love the intriguing line that it’s the story of how he died three times. I’m glad you got into Catching Jordan without knowledge of American football, the inaccuracies is one of the things that’s made me hold off on that one, but the story sounds good regardless. I loaned FDSTS to a friend a couple of months back since my TBR was so big anyway, but of course I’m anxious to get it back! I’m glad you enjoyed, I’m nervous because I just read Persuasion this summer, but since it’s not my favorite (though I really enjoyed it) I’m hoping I won’t be nit-picky. LOL – I’m all about the cryptic post titles obviously! Good to know I’m not the only one who hasn’t read SABRIEL – it’s one of those fantasy series that I’ve heard very good things about, but never quite managed to get around to reading it yet. I’m definitely moving it up my TBR pile though. It’s been a while since I’ve read PERSUASION, but I really want to re-read it now that I’ve read FDSTS. Like you, it’s not my favourite Austen so I was a bit more relaxed (if that’s the right word!) about FDSTS – now if it had been EMMA, I’d have been a bit more nervous about a re-interpretation. I’m looking forward to reading your take on it once you get your copy back. And yes, as I only have a *very* vague impression of what a quarterback does, if there were inaccuracies in CATCHING JORDAN, they obviously didn’t bother me at all! I’ve been wanting to read CONFUSION OF PRINCES but I saw some mixed reviews so I’ve been holding back – glad this was a winner for you, this gives me hope. I also have been eying CATCHING JORDAN too (also don’t know anything about American football – I tried going to games at my university, had NO IDEA what was happening). And I agree with you on FOR DARKNESS SHOWS THE STARS – I really enjoyed that one myself. Did you see Diana Peterfreund’s recent blog post – she’s doing a Scarlet Pimpernel retelling in the same world as FDSTS. Very cool. CONFUSION OF PRINCES was a fun read – I pretty much raced through it. It’s not a particularly in-depth book, admittedly, and I think that is probably its major failing – there are some events that were skimmed over, which could have been very interesting. And I think I’m proof you don’t have to know anything about American football to enjoy CATCHING JORDAN!